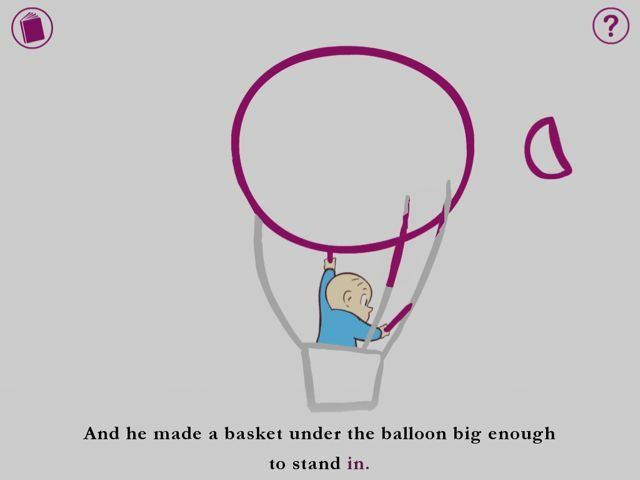 So begins the story of little Harold, a nearly bald little boy in a pair of blue pajamas. Fortunately for Harold, while he doesn’t have a moon, he does have the eponymous purple crayon. And a boy with a big purple crayon doesn’t need a moon, or anything else for that matter. He can draw it. Utterly adorable. Everything in this book is adorable. Every single thing. Harold is adorable. The moon is adorable. The road he draws, which is nothing more than two straight lines converging on each other in the distance, is adorable. 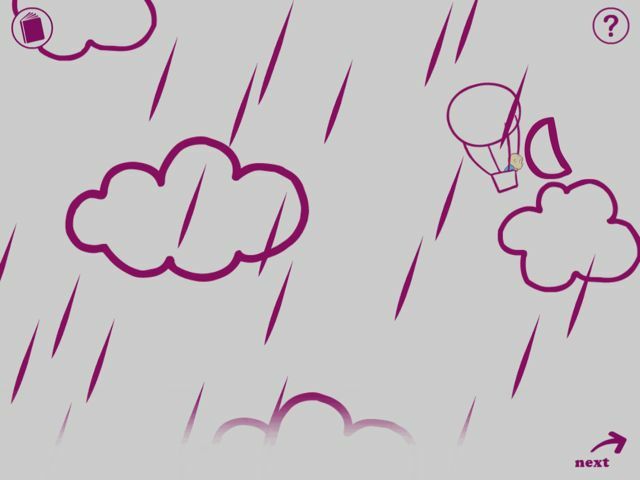 Harold, as you can see from the above images, is drawn in color. 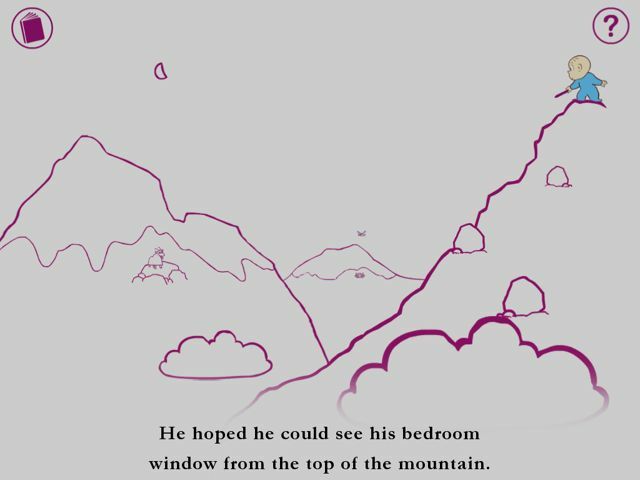 The entirety of the rest of the book is presented as purple line drawings on a plain, white background. Crockett Johnson’s original artwork was inspired. And Trilogy Touch’s iPad treatment of the artwork is precisely what Steve Jobs is talking about when he says the iPad is magical. 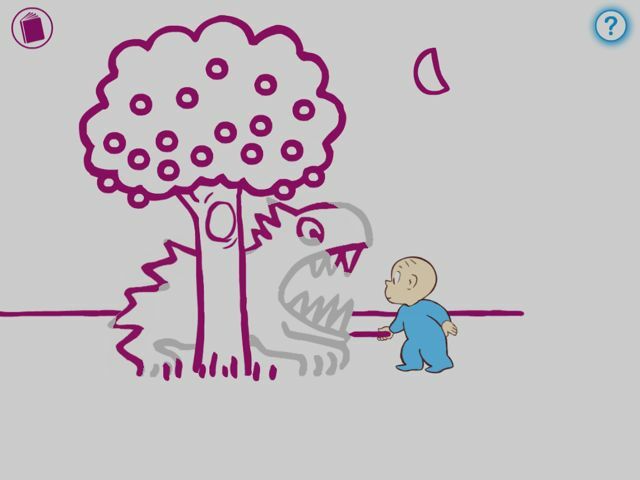 Harold’s purple tinted world springs to life on the iPad. The Dragon Harold draws to guard his apple tree (which he drew) breathes, in and out, moving up and down with each breath. The dragon scares even Harold, whose hand begins to shake as he backs away. The resulting Squiggly line looks just like water, which Harold finds himself suddenly plunged into. 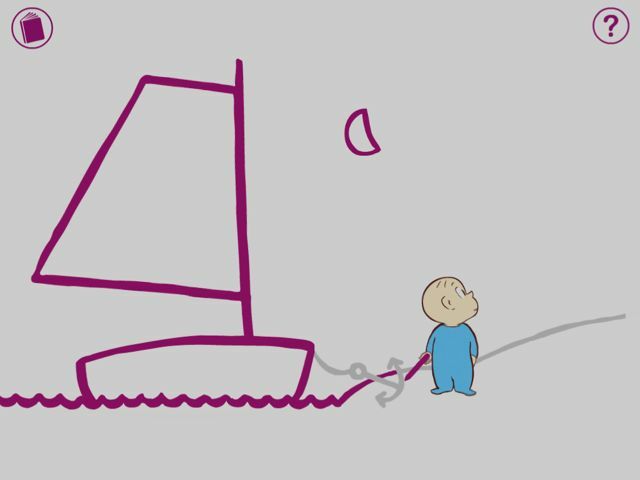 He quickly draws a boat and climbs aboard. The boat bobs realistically in the ocean and zooms ahead when its sail catches a gust of wind. It’s all hand-animated and, as I may have already mentioned, it’s all adorable. Harold and the Purple Crayon is filled filled with excellent sound work. Harold’s birds chirp and the sea gurgles. Pies are satisfyingly munched and taxi drivers honk their horns. The sound effects are all well chosen, and they are numerous. Harold’s music, on the other hand, is not spectacular. Throughout the book a pleasant lullaby plays in the background. It’s quite nice, but it isn’t long and it never changes. Sesame Workshop and Callaway Digital Arts set the standard for audio in an iPad story book with their groundbreaking adaptation of The Monster at the End of This Book. 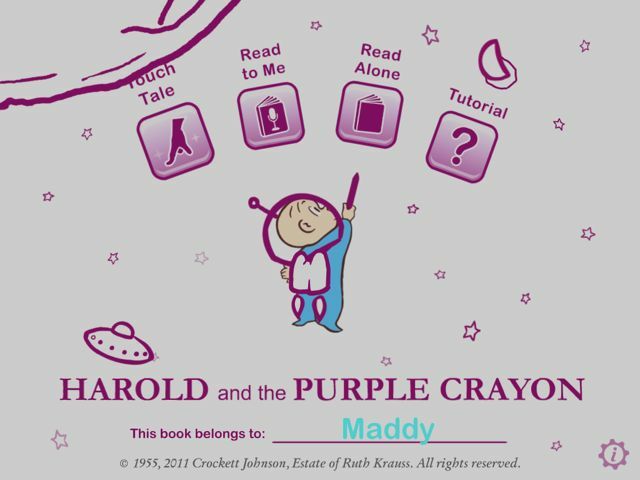 Harold and the Purple Crayon is not bad. Compared to most iPad books, it’s even pretty good. But compared to the best of the category, Harold and the Purple Crayon has substantial room for improvement in this category. 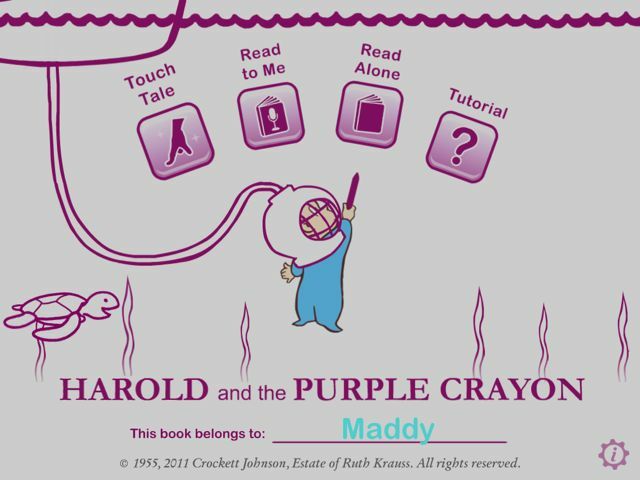 As the only book to give The Monster at the End of This Book a run for the title of best children’s iPad book, Harold and the Purple Crayon can’t help but draw comparisons to that excellent work. In my review of Monster I mentioned that my usual complaint about the absence of an option to record my own voice to replace the default narrator did not apply to that book, seeing as the entire book is narrated by the main character, Grover. Harold does not share the same immunity from my rule. This book is the perfect candidate for a voice-over feature. In fact, there is not a single book on my iPad that I would prefer replace the default narration. That isn’t to say that the default narrator is bad. She is excellent. But I’m better. Which is to say that when it’s my daughter having the story read to her, I want it to be read by me, even when I’m out of town and can’t be there to do it myself–and even when the default narrator is a highly talented professional. The iPad has a built-in microphone, and intuitive touch-interface. If you are a developer of iPad books, you’d better have a damned good reason to omit this obvious feature. Having your book narrated by Grover himself is one of the few qualifying excuses. Harold has no such excuse. Each book made by a developer that gets iPad interactivity is like a breath of fresh air. It’s amazing how many developers don’t get it. Interactivity for the sake of interactivity is pointless. I’m talking about things like touch-points on the screen that trigger animations that have nothing to do with the story. This type of interactive feature would insult the intelligence of readers except that even children quickly become bored with these things and almost immediately ignore them completely. 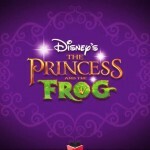 Trilogy Touch gets iPad interactivity. And that’s how it managed to make this iPad book superior to its source material, a beloved classic work that has endured for more than half a century. Your child will not just sit passively watching the story told, and touching tacked on “interactive elements” periodically. Harold’s purple crayon becomes an extension of your child’s finger. Your child must draw his/her way through the story book. It’s easy. The drawing is all guided. Most 3-year-olds can probably pull it off. But it makes all the difference. Your kid will be sucked into Harold’s world by this interactivity, and love every minute of it. My daughter loves this book. She loves drawing the pictures for Harold. She loves the story. She seems to love the idea of being able to create and fall into her own world. The fact that it’s done with a crayon is icing. I believe that Harold’s magical crayon is a concept that appeals to children on a very deep level. Children have little control over anything in their lives. Their world, their reality, is shaped (drawn, so to speak) entirely by other people–parents, teachers, etc.. I think a lot of misbehavior and seemingly random defiance from children stems from feelings of frustration and helplessness about the lack of personal dominion over their own lives. Harold is able to create his world from the ground up, exactly the way he wants it to be. This is an ultimate fantasy for almost any child. I can’t attribute my own love for this book to feelings of frustration and helplessness with regard to a lack of control over my own life. But it is more than just a cute children’s book. 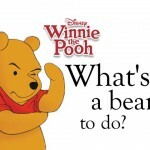 As you read this, you can see how it connects with children on an acutely personal level. You can see how brilliant Crocket Johnson’s idea and execution were. He got children–he understood their fears and desires. This book is an articulation of what they feel. And although it won’t speak to you as an adult the way it would have when you were a child, you will still love this book for more than the simple fact that your kids love it (though they will). Even as an adult, you will identify with Harold. Because once upon a time, you were in his shoes. And what you would have given for that big purple crayon. 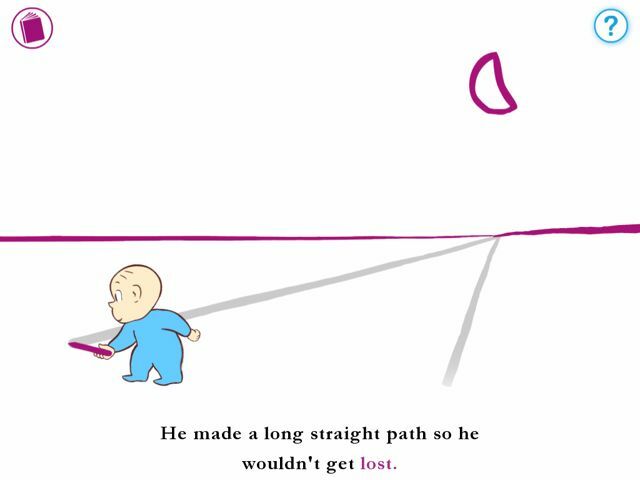 Harold and the Purple Crayon is a near-perfect book. If it had the option of replacing the default narration with my own voice, I would have rated it 5-stars. As it stands, though, the narration is excellent, as is virtually everything else about this wonderful little app. It is clear that this was a labor of love for Trilogy Touch. Their attention to detail goes well beyond what is necessary. For example, there are at least five different title screens. Sometimes Harold is an astronaut, sometimes he’s surrounded by butterflies, sometimes he’s under the sea in a diving helmet. It’s entirely unnecessary, but very charming. I’m excited to see what the developer has in store for us in the future (they’re currently working on an app based on the Despicable Me property). At $5.00 Harold is one of the more expensive storybook apps on the app store, but it is worth every penny. Harold is a must buy. This is awesome post and very helpful post. I appreciate the information provided. Keep up the good work. 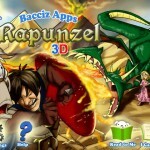 Best iPad apps. Why isn’t this available in the US App Store? It is available in the US. Try the link at the end of my review. I’m on the road now, but when I get home later today I’ll check to make sure my link is going to the book in the US app store. We used to have it, and my daughter loved it. Somehow it must have been deleted, and I tried to download again, but it’s no longer available, but I also can’t find out why or if/when it will be back….